See this classic Academy Award®-winning crime drama for just $5 on February 3, 4 & 6 in select Marcus Theatres! Widely regarded as one of the greatest films of all time, this mob drama focuses on the powerful Italian-American crime family of Don Vito Corleone (Marlon Brando). When the don’s youngest son, Michael (Al Pacino), reluctantly joins the Mafia, he becomes involved in the inevitable cycle of violence and betrayal. Although Michael tries to maintain a normal relationship with his wife, Kay (Diane Keaton), he is drawn deeper into the family business. 1. The film is based on Mario Puzo’s 1969 novel that remained on The New York Times Best Seller list for 67 weeks and sold over 9 million copies in two years. 2. Approximately 90% of the film was shot in New York City and its surrounding suburbs, using over 120 unique locations. 3. The opening wedding scene was shot in a Staten Island neighborhood using almost 750 locals as extras. 4. The Godfather broke many box office records to become the highest grossing film of 1972 at $81.5 million. 5. It was nominated for seven Academy Awards® and won three, including Best Actor for Marlon Brando and Best Picture of 1972. McBride Homes, Missouri’s largest home builder, is under contract for a new development located in The Hill neighborhood of St. Louis City. Phase 1 will include 58 homesites. The property is located off Bischoff Avenue and Hereford Street. The new McBride community, The Manors at La Collina, will include 58 single family homes. The community will offer a new top-of-the-line single family home product with brick fronts reminiscent of The Hill’s traditional neighborhood streetscape, plus rear entry one and two car detached garages with rear entry alley access. McBride Homes is partnering with the site developer, Draper and Kramer, to develop the site. McBride is taking the lead on the single family homes, while Draper and Kramer is developing an apartment complex on the adjacent property. The neighborhood is expected to open for information in Summer 2019. McBride Homes, celebrating over 73 years of building, offers homes in over 40 communities in metro St. Louis. McBride is based in Chesterfield and is the largest homebuilder in St. Louis and the state of Missouri. The company is currently ranked as the 41stlargest privately owned builder in the country and is 64th largest overall. Don’t miss Gioachino Rossini’s delightful opera “L’Italiana in Algeri” (The Italian Girl in Algiers)performed by Winter Opera St. Louis at Missouri Baptist University on Jan. 25 (7:30 p.m.) and Jan. 27 (3 p.m.). “Meet” the courageous, feisty heroine Isabella as she battles Mustafa’ in one of opera’s best-loved comedies. (Cost: $10 – $55) Location: Performance Hall/Pillsbury Chapel, 1 College Park Drive, St. Louis 63141. In Italian with English supertitles. Tickets available at https://winteroperastl.tix.com. (Not refundable) More information at (314) 865-0038. 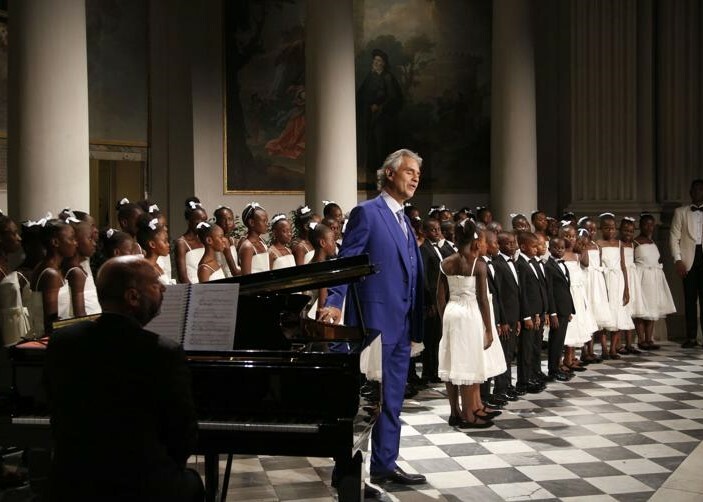 Italian singer-songwriter Andrea Bocelli will return to Denver for the first time in five years. The tenor will perform June 21 with the Colorado Symphony at Pepsi Center. Tickets are $82 to $368 and go on sale at 10 a.m. Dec. 10. Call 866-461-6556 or go online to altitudetickets.com. Citi card members can purchase pre-sale tickets from 10 a.m. Monday through 11 p.m. Dec. 9. Go online to citiprivatepass.com. Fan Club members can purchase pre-sale tickets online at altitudetickets.com from 10 a.m. Dec. 5 through 11 p.m. Dec. 9. Interested in attending a Christmas market – similar to those in Italy and throughout Europe? The City of Belleville (IL) invites you to their 5th Annual Christkindlmarkt open now through Dec. 23. Situated around the Belleville Square, this authentic German-style Open Air Christmas Market is open daily and includes several Christmas stalls where German and European gifts, novelties, and food are sold. Horse-drawn trolley rides shuttle visitors through the event on Fridays, Saturdays, and Sundays through Dec. 23. Family events are available every weekend (some in a heated tent). There’s even a reindeer! More data at www.bellevillechristkindlmarkt.com or by calling 1-800-677-9255. This is a formal event; black tie optional. Masquerade masks in the style of Venice’s Carnevale not required, but strongly encouraged! Price: $125 per person + $2.5 per ticket for fees if bought online. Tables of 8 or 10 are available. The night kicks off with a special performance in a typical Venetian style; followed by Music and Dancing, along with other surprises throughout the evening. We are looking forward to a beautiful evening, with great music, great food and great company! If you have any questions or need additional information, feel free to contact us!